Cutting your ribs into individual bones allows you to get them into your pressure cooker, which will greatly cut the amount of time between you and deliciously tender barbeque ribs. These are a great party food, but also can be a relatively quick dinner main dish. Use your favorite store-bought barbeque sauce or make a batch of your own. Per Serving: 894 calories; 49g fat; 74.9g carbohydrates; 38g protein; 132mg cholesterol; 2381mg sodium. I thought these ribs could have used a dry rub seasoning other than salt and pepper. I always mix chile powder, sugar, cumin, dry mustard, cayenne pepper, etc. Also, I used more than 1 cup of sauce. I'd make this again, just with these minor changes. The key to this recipe is a really good sauce. I used my favorite, homemade BBQ sauce recipe, which includes ketchup, apple cider vinegar, light brown sugar, onion powder, ground mustard, lemon juice and Worcestershire sauce. When you use a quality sauce, you don't really need any extra seasonings. This is one of my favorite recipes, I make it over and over again. I used a homemade barbecue sauce infused with New Mexico peppers and it was delicious. I did make one mistake, I read the ingredients list as "apple cider vinegar" instead of "apple cider". Can't really tell if it made a difference or not, I thought they came out phenomenal. 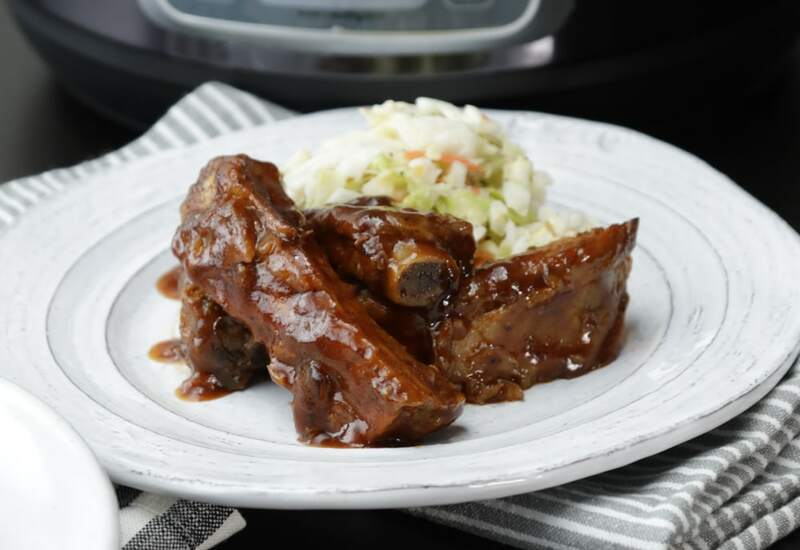 I've made pressure cooker ribs before but did not cut them into individual bones. This was such a great idea. Last time I cut them in halves or thirds. I made this specific recipe for a party at my house and made a batch of my own sauce. Everyone loved it! They were delicious and tender. Making ribs in my pressure cooker has saved me so much time! At the last minute some friends came over and I was able to fix these really quick. I used store-bought honey bbq sauce and water instead of apple cider vinegar. Perfection! Can I triple this recipe? Excellent!!! Fell right off the bone. Delicious, meat fell right off the bone and the flavor was perfect. Total prep and cooking time was closer to 60 minutes though. I followed the directions given and they literally fell off the bone!!! I used Apple cider vinegar (I was confused at first if they just meant apple cider or apple cider vinegar) but it was amazing! My first time ever making ribs. I just bought honey baby back rib bbq sauce. Definitely recommend trying! !